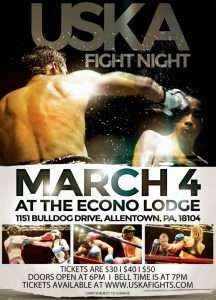 USKA Fight Night will be held tonight at the Econo Lodge in Allentown, Pennsylvania and broadcast via futureofthegame.tv. 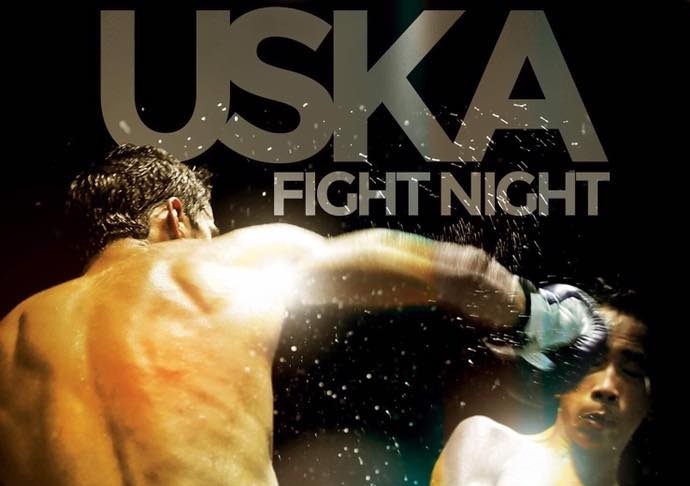 USKA President Irv Althouse and matchmaker Jen Heffentrager assembled a 13-fight all amateur kickboxing and Muay Thai card for fight fans. The house was packed in what appeared to be a sell out crowd. After a beautiful rendition of the National Anthem, Althouse asked the audience to bow their heads for a moment in honor of the men and women of the United States Armed Forces. Also, a ‘Happy Birthday’ was extended to referee Don Gladfelter who celebrated the day by officiating the night’s fights. In the main event, a Muay Thai title bout between Luis Guaillas of Rami Elite in Philadelphia, and Jeremy Hernandez of Maisonets Thaiboxing Gym. Right off the bat Guaillas pulled off a Keanu Reeves ‘Matrix’ like maneuver dodging out of the way of a big kick from Hernandez. Moments later however Hernandez would catch Guaillas with a knee that pushed the Rami Elite fighter partially through the ropes and the contest was reset. The two Thai fighters continued to battle to the bell. In the second round Hernandez really loaded up on the knees in the clinch while Guaillas relied more on his feet. Twice in the round Guaillas loaded up a kick that missed, landing his leg over the top rope temporarily impairing the fighter. In the third and final round Guaillas came out with a new found aggression immediately attacking with heavy punching power but the two kept falling into a clinch where they would be separated by the referee. Hernandez landed a straight left that landed clear to the center of the face of Guaillas. The action kept pushing forward right to the final second with Hernandez claiming the strap. Photo gallery below by MyMMANews photographer William McKee. Click to view. The first fight of the night started off with fireworks as Ty Graffin defeated William Johnson via unanimous decision on the judges’ scorecards. The fast paced fight was back and forth and the crowd was extremely entertained, cheering on the two combatants. Demeko Boyd put on a clinic from bell to bell in the first round and eventually KO’d Hector Reyes in the second. If you were in attendance and never heard of Maisonets Thaiboxing Gym of Brooklyn, New York before the action began, you knew who they are now. Big win by Boyd. The third fight of the featured two heavyweights in Adam Soley and Franklin McDaniel. When these guys hit you feel it the next day, and the day after that. Soley went down early in the second and couldn’t get back up to continue, thus McDaniel was declared the victor. Good scrap from the big boys. Trevor Behler vs. Andre Fambro started out fast but as the fight progressed and the wear set it, both fighters faded. It wasn’t that they were not conditioned but that their skills were so evenly matched and they were each hitting each other with everything but the kitchen sink that it took a toll. In the third and final round Behler was knocked down but stood back up and hurt Fambro, backing him up against the ropes. Once Fambro collected his thoughts he threw a high kick that landed flush on the face of his opponent. Behler is stunned but the fight goes on to the bell and goes to the judges with Fambro getting the win. TJ McDonough vs. Josh Carr was one hell of a scrap. Carr, the 2016 USKA Rookie of the Year, had a rough outing in the opening seconds of the fight. McDonough was obviously the physically stronger and imposing fighter, but Carr hung in there, listened to his corner in Zak Kelly of Gracie 717, weathered the storm and put a pounding on his opponent. Carr who was covered in blood, later to be determined not his own, finished McDonough with a series of knees to the body in the second round and then called for a title shot following the win. Daniel Santiago defeated Michael Rivera via unanimous decision. Santiago, another Maisonets Thaiboxing Gym protégé, took this fight on just two days notice after Rivera’s originally scheduled opponent fell off the card. Immediately following the intermission James White and Alex Gregro exchanged some heavy hands. White connected with big shots including two superman punches that knocked Gregro to the canvas twice. White continued the pummeling, bloodying his opponent before referee Don Gladfelter called an end to the contest. Arielle Webb defeated Liz Mooring via unanimous decision in a highly entertaining three-round kickboxing war. What was interesting was that Webb’s entire corner was all female. I don’t think I’ve ever seen that before on either an amateur or professional level. You could see the sisterhood on their faces with every shot Webb dished out and or received. Definitely a story I want to follow up on. Jon Musser received a huge pop and standing ovation from the crowd as he took on Joe Hogle in a Muay Thai bout. It appeared as if Hogle towered over Musser in height by at least a foot, a David vs. Goliath type fight in that aspect. In this instance however, the story would have a different outcome. Hogle used his reach to consistently pepper Musser and keep him at bay. When did get him in the clinch Hogle used the knees to his advantage, eventually en route to a decision victory. Ryan Grassie returned to the USKA ring with his 9-2 record going up against Eric Strausser. This was a fun fight. Strausser even used his MMA experience to his advantage in the USKA rules contest. At one point when Grassie missed a spinning backfist Strausser almost applied a rear-naked choke, but backed off the maneuver. Strausser bloodied Grassie up throughout the contest but it was not enough to get the judges to score in his favor. Grassie took home a unanimous decision win. 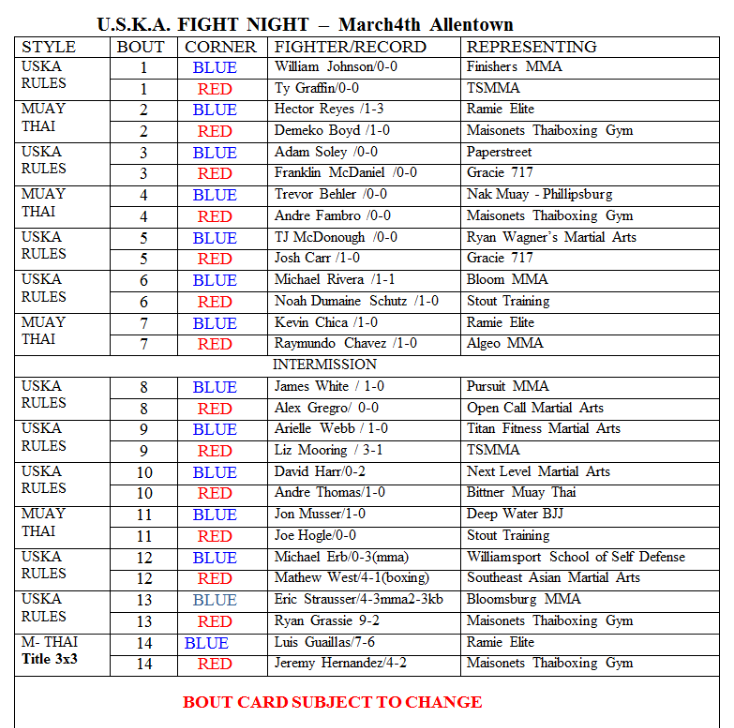 Get information on upcoming USKA cards at USKAFights.com and on Facebook.